Nayif-1 has now been in orbit for more than two weeks and all systems continue to operate nominally. The power budget is positive, the spin/tumble rate is acceptably low, on board temperatures are perfectly ok and, importantly, the educational/amateur transponder switching is taking place autonomously as planned. 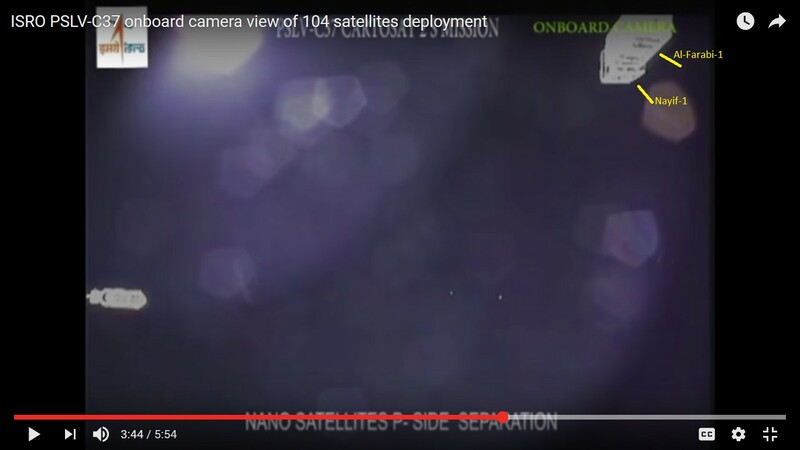 This image, by ISRO, shows the moment of deployment of Nayif-1. Nayif-1 has also been granted an “OSCAR” number and now has the secondary title of “EO88 – Emirates Oscar 88”. More than 250 stations around the world have provided telemetry to the Nayif Data Warehouse and we are extremely grateful to them for their invaluable support. We have now updated the Dashboards for both Nayif-1 and FUNcube-1 so that they display only the telemetry received from the individual spacecraft that they are designed for. This will help users to display only the correct information and graphs and reduce confusion. Whilst they only display the data from ONE spacecraft, they will, as now, receive and decode the data from all FUNcube payloads currently in orbit and automatically submit it to the relevant Data Warehouse.